Balance refers to the location of the CG of an aircraft, and is important to stability and safety in flight. The CG is a point at which the aircraft would balance if it were suspended at that point. Figure 10-1. Lateral and longitudinal unbalance. Location of the CG with reference to the lateral axis is also important. For each item of weight existing to the left of the fuselage centerline, there is an equal weight existing at a corresponding location on the right. This may be upset by unbalanced lateral loading. The position of the lateral CG is not computed in all aircraft, but the pilot must be aware that adverse effects arise as a result of a laterally unbalanced condition. 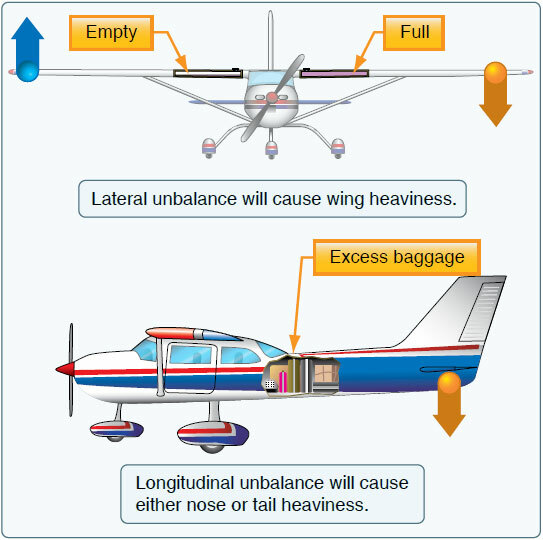 In an airplane, lateral unbalance occurs if the fuel load is mismanaged by supplying the engine(s) unevenly from tanks on one side of the airplane. The pilot can compensate for the resulting wing-heavy condition by adjusting the trim or by holding a constant control pressure. This action places the aircraft controls in an out-of-streamline condition, increases drag, and results in decreased operating efficiency. Since lateral balance is addressed when needed in the aircraft flight manual (AFM) and longitudinal balance is more critical, further reference to balance in this handbook means longitudinal location of the CG. Flying an aircraft that is out of balance can produce increased pilot fatigue with obvious effects on the safety and efficiency of flight. The pilot’s natural correction for longitudinal unbalance is a change of trim to remove the excessive control pressure. Excessive trim, however, has the effect of reducing not only aerodynamic efficiency but also primary control travel distance in the direction the trim is applied. Adverse balance conditions affect flight characteristics in much the same manner as those mentioned for an excess weight condition. It is vital to comply with weight and balance limits established for all aircraft. Operating above the maximum weight limitation compromises the structural integrity of the aircraft and can adversely affect performance. Stability and control are also affected by improper balance. Loading in a nose-heavy condition causes problems in controlling and raising the nose, especially during takeoff and landing. Loading in a tail heavy condition has a serious effect upon longitudinal stability, and reduces the capability to recover from stalls and spins. Tail heavy loading also produces very light control forces, another undesirable characteristic. This makes it easy for the pilot to inadvertently overstress an aircraft. Limits for the location of the CG are established by the manufacturer. These are the fore and aft limits beyond which the CG should not be located for flight. These limits are published for each aircraft in the Type Certificate Data Sheet (TCDS), or aircraft specification and the AFM or pilot’s operating handbook (POH). If the CG is not within the allowable limits after loading, it will be necessary to relocate some items before flight is attempted. The forward CG limit is often established at a location that is determined by the landing characteristics of an aircraft. During landing, one of the most critical phases of flight, exceeding the forward CG limit may result in excessive loads on the nosewheel, a tendency to nose over on tailwheel type airplanes, decreased performance, higher stalling speeds, and higher control forces. In extreme cases, a CG location that is beyond the forward limit may result in nose heaviness, making it difficult or impossible to flare for landing. Manufacturers purposely place the forward CG limit as far rearward as possible to aid pilots in avoiding damage when landing. In addition to decreased static and dynamic longitudinal stability, other undesirable effects caused by a CG location aft of the allowable range may include extreme control difficulty, violent stall characteristics, and very light control forces which make it easy to overstress an aircraft inadvertently. A restricted forward CG limit is also specified to assure that sufficient elevator/control deflection is available at minimum airspeed. When structural limitations do not limit the forward CG position, it is located at the position where full-up elevator/control deflection is required to obtain a high AOA for landing. The aft CG limit is the most rearward position at which the CG can be located for the most critical maneuver or operation. As the CG moves aft, a less stable condition occurs, which decreases the ability of the aircraft to right itself after maneuvering or turbulence. For some aircraft, both fore and aft CG limits may be specified to vary as gross weight changes. They may also be changed for certain operations, such as acrobatic flight, retraction of the landing gear, or the installation of special loads and devices that change the flight characteristics. The actual location of the CG can be altered by many variable factors and is usually controlled by the pilot. Placement of baggage and cargo items determines the CG location. The assignment of seats to passengers can also be used as a means of obtaining a favorable balance. If an aircraft is tail heavy, it is only logical to place heavy passengers in forward seats. Fuel burn can also affect the CG based on the location of the fuel tanks. For example, most small aircraft carry fuel in the wings very near the CG and burning off fuel has little effect on the loaded CG.